The true story of Martin Luther and the Reformation. At the boarding school in Eisenach, Martin and his friends had to sing for their supper. 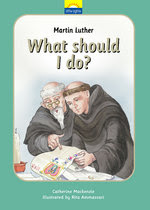 Martin spent a lot of time thinking about how to get to heaven - he thought that he had to pray for hours on end, eat very little, work very hard and study a great many good books, in order to have his sins forgiven. However, as he began to read God's Word for himself, he discovered that the answer was not in doing these things, but by putting his trust in the Lord Jesus Christ.